The Accounts Receivables menu is for the entry of all transactions that are involved with Income for the company. This may be through Cash Sales or Client Invoices etc. These records directly affect the General Ledger and are normally based upon paper documents. This menu also allows the printing of deposits for receipt of money. The SapphireOne solution allows the user to efficiently manage accounts receivables, customer tracking, invoice management, analysis of customer activity, receipt and cash receipt processing. Receivables is fully integrated with the entire SapphireOne solution, dynamically updating the whole of SapphireOne Financials. Debtors control account, the general ledger and bank reconciliation will be instantaneously improved. In the first section of the menu are the two main Data Entry screens; Cash Receipt is one of them. Cash Receipt (MR) is used when no client details are available for entry into the transaction. Selection of the relevant bank account will determine what type of payment is received. For example, cheque, credit card or cash accounts which are set up in the General Ledger. SapphireOne performs a considerable amount of error checking before you are allowed to save the transaction. This may be seen on the main toolbar when the green tick is displayed allowing the saving of the current transaction. By entering a valid Client ID any applicable client details that are in the client’s master file are automatically entered into the invoice. The transactions area has the client details recorded and the remainder of the data entry procedure is the same as the Cash Transaction screen. Client Invoice (CI) is for the entry of invoices to the General Ledger. This area displays the prompt payment discount terms as set up for this client in his master file if payment is made early. Client Credit Memo allows the entry of credits. For example, when goods are returned by the client. A Client ID is needed for the entry of details and it is very similar to the previous two functions – a Cash Receipt and a Client Invoice. 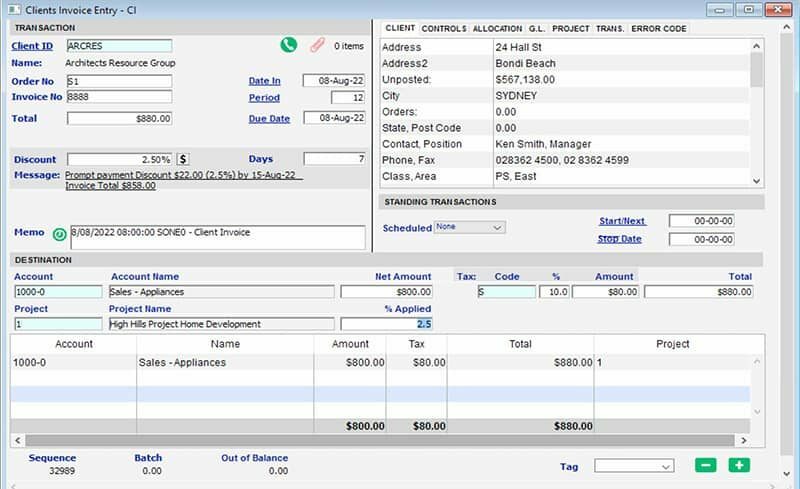 This function also has additional pages that are identical to those in Client Invoice, Custom, Action and Documents. Credit Memo (CC) allows for the generation of credits. For example, return of faulty or incorrect goods supplied. Once the Credit Memo has been entered the green tick on the main tool bar will be displayed so that the user may select it and when selected the system will display the Allocation function enabling the user to immediately allocate the credit to another invoice. The Client Journal entry procedure is very similar to a Cash Receipt or Client Invoice. If there is a negative number, then insert the $ and bracket it to indicate a negative amount. For example: ($500.00). Client Journal (CJ) is used when client balances need adjustment. For example, an error has been made or a credit not been applied correctly. 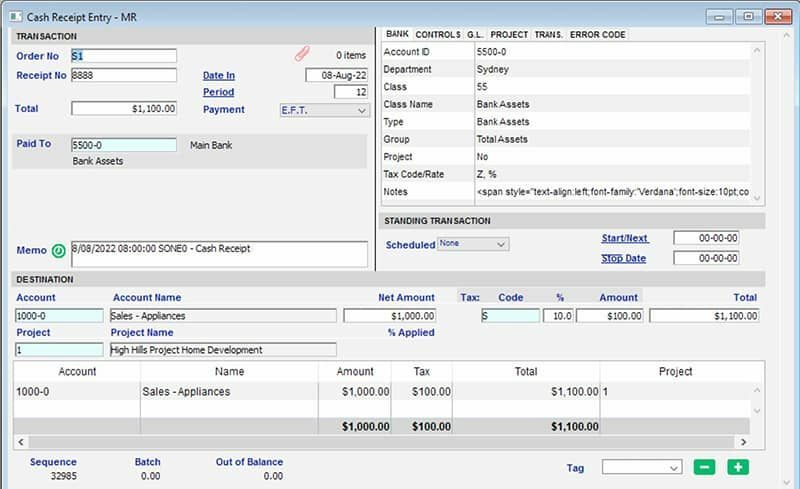 The custom page for a Client Journal is identical to the custom page when the Cash Receipt function is executed. Data entry for this function is very similar to the Cash Receipt screen but we now have a Client ID. Once the Client ID is entered the system will populate the details in the transaction area from the details as entered in the client’s master file. Client Receipt (CR) manages the receipt of money from client’s for payment of accounts. Once all data entry is correct, the system will display the green tick on the main toolbar. Once it is selected, the system will display the allocation screen enabling the selection of invoices that are to have the client receipt allocated to. We have partnered with Stripe so you can accept credit card payments online or in-person. Sapphire Web Pack for on-the-go mobile payments and SapphireOne client-server desktop for digital payments. Enter in client’s credit card details: Number, Name of Account Holder, Expiry Date, CCV and process. Option to save primary card details. There are four Inquiry screens that allow you to search and access your main Client files. There are – Transactions, Allocations, Clients and Class. When a Transactions Inquiry is selected the system displays a screen that lists all current transactions for clients. These will be listed initially by default in Sequence number order. A number of Sorting and Finding functions are available from all list screens in the SapphireOne system. These are documented in Chapter 3 of the Navigation and Procedures manual of SapphireOne enterprise financial accounting software. Transactions are listed in order of entry with the most recent at the top. Like other list windows you can manipulate the information that is displayed in the list by highlighting and using functions from the Options Menu or by using (Command K) and selecting from the Options as listed. The Client Allocations Inquiry screen is similar to a Transaction Inquiry screen. This function only displays those records that the system thinks have not been fully allocated for some reason. Normally when a transaction is created and the system determines that an allocation should be made; it will immediately display the allocation screen limited to the Client for whom the transaction has been auctioned against. The user may then make an immediate allocation. The main purpose of this screen is to allocate transactions for Open Item Clients against their respective transactions that have not yet had an allocation made against them for some reason. For example, a Receipt against the appropriate Invoice. By default, when this function is selected any transactions for all Clients that the system determines have not been fully allocated will be displayed. By default only transactions that are less than 100% allocated are displayed. The initial Client Inquiry list screen presents a window that contains a list displaying some of the basic details about each Client. This will allow you to easily find and select the required Client for additional viewing or modifying. SapphireOne retains strict audit control and therefore does not allow the deletion of Clients. A Client may be changed from an Active Client to an Inactive Client and vice versa provided that they have a zero balance and there are no outstanding transaction auctioned against them when they are made inactive! The Class Inquiry option allows the grouping of Clients into standard areas/groups as applicable to your business. This expands the sorting or grouping of your data in the production of reports generated from SapphireOne. The Post Transactions function presents a window which contains all current transactions awaiting posting listed in date order. Activities here will carry the transactions through to the General Ledger updating the balances in all accounts concerned. It should be noted that this posting function will list all the un-posted transactions entered in the Receivables menu for the current period or prior periods. These are transactions that have the Status code of ‘ent’ for correctly entered and thus ready for posting. A status code of ‘Yes’ means that the transaction has successfully been posted. This function prints out a report of all Deposits entered into the Bank Accounts. This can then be used to check that all deposits have been entered and can also be used to deposit money into the Bank. Maintain detailed and accurate customer information with particulars that include but are not limited to client address, telephone, fax, email, shipping details, tax settings, payment terms, credit control, credit card, bank details and complete historical information. Tailor your records to reflect information specific to your organisation’s requirements with customised fields. With 20+ user-defined fields, adapting information particular to your industry is easy. Improve customer service with the ability to record individual address details for client’s primary, postal, ship-to, bill-to and invoice addresses. Picture fields can be customised for each location and sales staff can locate client sites with ease by simply adding street maps or images of the site in each record. Unlimited history means that you can view all historical transactions, distribution or activity history for a particular client/vendor. Historical data may be sorted or reviewed by calendar or financial periods giving you the information you require when and where you require it. SapphireOne records the details of clients, including direct telephone, facsimile or mobile numbers, as well as individual e-mail. Each contact also has a notes facility allowing you to keep track of important information relating to the individual. Add notes to individual client files to assist in tracking important information. All notes are date, time and user stamped for accurate record keeping. In addition to the standard demographic fields, SapphireOne allows you to enter searchable keywords that relate to the client. Analyse all aspects of sales activity with SapphireOne’s comprehensive reporting functionality. Create new reports or use one of the many standard report templates within SapphireOne. Customise reports to detail the information you wish to view, allowing you to meet your exact requirements and save for future use. Designed with flexibility in mind, reports can be sorted by calendar or financial year with numerous levels of detail to choose from. Comparison accounting means that you are able to review current and past periods with ease and are ensured of accurate information customised to your specific needs. With SapphireOne’s relational database you are able to perform quick searches to review desired information on screen when and where you need them. Easy. With SapphireOne’s quick report and super report functions, the user can sculpt reports to individual needs. Tailored reports can be created and modified quickly and easily, with the ability to save for repeated use. Create a simple column based or full graphical reports with the ability to export or import data to or from spreadsheets and other applications into SapphireOne. Unlimited history means that any transaction can be reported on at any time with the ability to drill down to source information. At any time the original transaction can be reprinted and is particularly useful in audit reviews. Perform simple or powerful queries on every field and file relating to sale transactions, payments and customer movements. Detailed searches can be saved for use in the future with the benefit of being able to create and save reports based on the search results. SapphireOne’s menu structure means you can access core information of interest and trace it back to the originating transactions. Retrieve client information from contact details, credit limits, historical purchasing to make educated decisions or efficiently respond to queries. Employees are able to securely access SapphireOne over the Internet, receiving or modifying information in real-time, extending the boundaries of your office environment. Create, post, and distribute financial reports electronically allowing circulation of vital data. Receive accurate data and make informed decisions without the need to be physically present in the office environment. Review sales activity by period, calendar or a financial year, or analyse the trends of client returns and sales via a local area network or the Internet. Client details are dynamically imported to all transactions including address details, prompt discount rates, tax codes, tax rates, currencies, sales reps, payment terms, bank, cheque and credit card information. Default information can be overwritten if required. SapphireOne’s foreign exchange handles transactions in any currency, allowing your organisation to trade with regional and worldwide markets. With complete export/import manager, on-costing and inventory control, overseas commerce is easier than ever before. Allocate receipts to an invoice, linking the transactions for easy tracking. This function is particularly useful when a client is paying multiple invoices with one cheque. Modify client specific information or perform mass modifications to fields such as client class, automatically updating all the relevant files without re-entering. Automatic notification when clients have reached their credit limit or have had a credit stop assigned to them. Revise credit information while entering transactions, ensuring transactions are processed correctly and efficiently. SapphireOne has a number of levels that may be set for credit limits to be imposed on clients. This ranges from simple warnings to the user, to completely blocking the raising of any transactions to the client. Automated emails may also be set up to be sent to clients when they exceed their credit limits. Unposted transactions may be deleted with the click of a button while retaining a thorough audit trail. Posted transactions may also be reversed with the same audit trails as mentioned above. All transactions can be searched and retrieved at any point in time. SapphireOne enables the entry and tracking of multiple tax rates to accommodate GST, VAT, Sales Tax and other tax systems effortlessly. SapphireOne allows you to set up a master client (parent) with as many subsidiaries, franchisees, related companies, divisions or departments (children) as required linked to the master client. The parent and children can run independently of one another with the advantage that payment by the parent organisation can be allocated to multiple children’s invoices. SapphireOne’s activity queue allows you to schedule tasks to be performed by SapphireOne on a regular basis, including the printing of statements, analysis reporting, backup procedures and statement of position which SapphireOne can email to the appropriate person periodically as specified. SapphireOne’s client server facilitates transaction rollback and retrieval for controlled procedures. In the event of a power outage or system crash data integrity is still maintained.